Yes, I am a pattern repeater...there, I said it! I don't even feel badly about it as I feel like repeats are the way you perfect a pattern, play with different fabric weights and types and just have fun experimenting! I’ve made two of these jackets and are made from Fabric Mart beauties. My first was a lacey, wavy, striped knit that I am just so pleased with! I've worn it and received many compliments on it! That is a winner in my book! This lace behaved so beautifully as it didn't stretch out of shape, washed and dried like a champ and also was perfect for the little details of this jacket such as the more fitted sleeves and armhole areas. I HAD to make another and so I choose this fun and funky floral that is off white with shades of brown, coffee, and black. Neutrals are my friend! I love sewing with colors such as these but also knew my wardrobe needed some color too! I decided to use contrasting fabric for the facings along the neckline and the sleeve cuffs. This pretty and punchy red was the perfect compliment--not only color wise but also weight and fabric type. It is slinkier than the floral and feels so nice on my skin! Isn't that always a bonus? This is a StyleArc pattern that I purchased from Etsy called the Lillian Knit Jacket. This came as a PDF. Ever wonder what PDF means? It is Portable Document Format and that is exactly what a pattern is that comes as a download. No more waiting for the mail service from half way around the world to deliver a pattern from Australia! There are a few things you need to know if you've never used a PDF. First, your printer MUST be set to the correct format or your pattern will end up the wrong size! Always print out a test page and get your ruler out to measure. It needs to be exact! 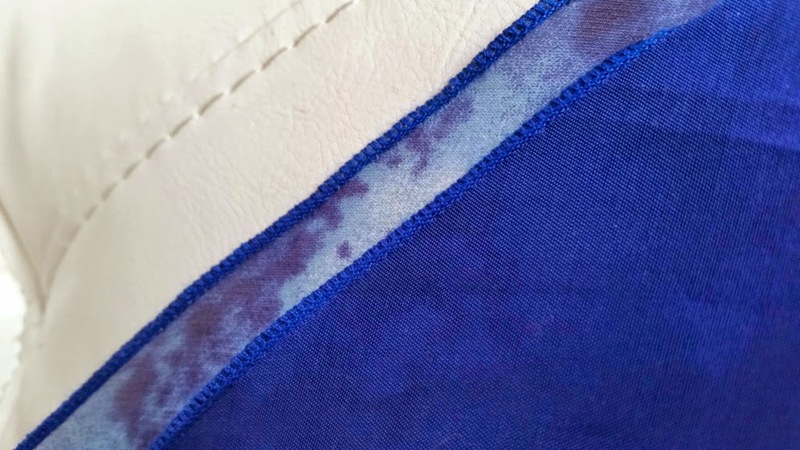 It's one thing to take a garment in, but letting out is another story, especially when the seam allowances are only 1/4" as in the case of Style Arc. This is too big. 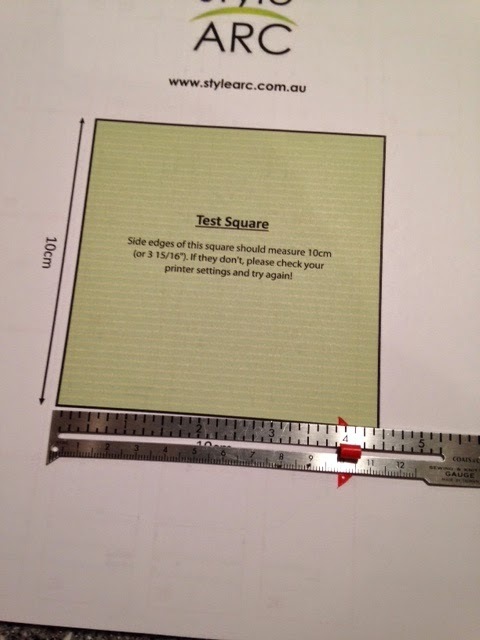 The test square should be 10 cm or 3 15/16". I had to change the setting on my printer before printing again. See the difference? 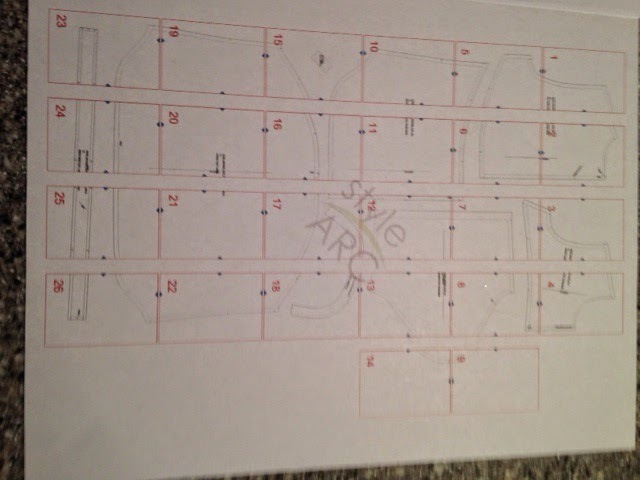 After printing, check the legend for the layout of your pieces. 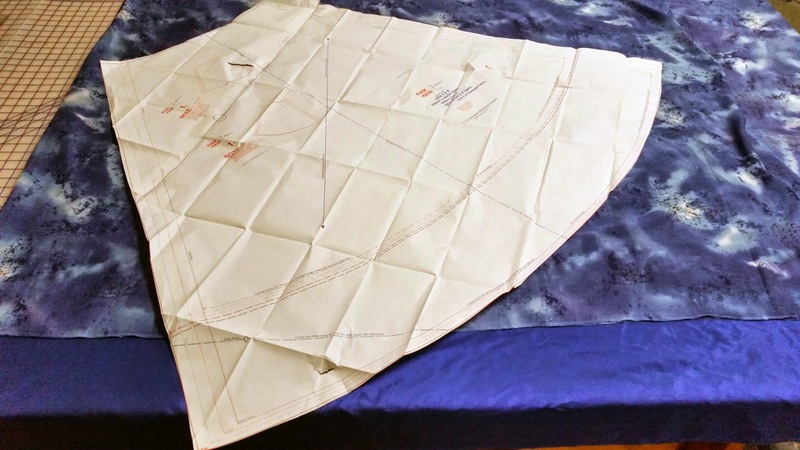 This gives you great information on how you need to piece the pattern pieces so to speak! 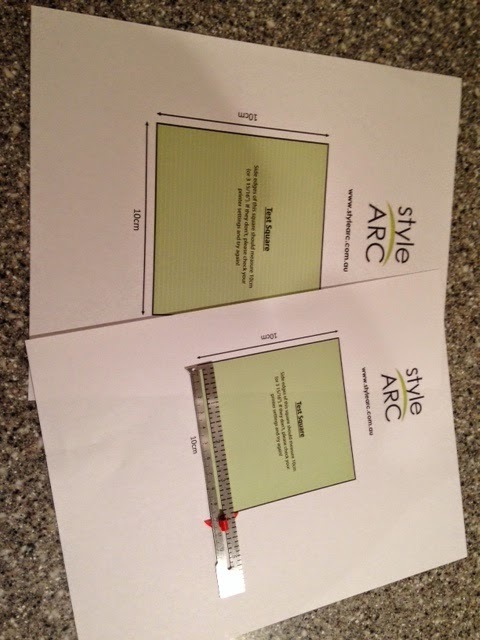 And, here is a beginning of a layout. You need a big space for this! So back to the pattern and fabric! What gives you a slim fit is the styling of the sleeves and how you fit the underarms. You have to pivot at the points on the fabric. You can see how I did that below. Sew, pivoting at the point, then clip! Look at what a great result you get! This is an easy to put together and was easier the second time! You can really see the pop of red at the center front and slightly at the cuffs. The length of this pattern is great--it covers all the body parts you want covered without feeling like you need to tug it down all the time. See how nice this fabric hangs in the back? It doesn't cling at all! Here you can see the red contrast. The facing is stitched down. I also like to serge the edge of facings, which I know isn't necessary with a knit but it helps 'clean up' my edges and also gives the knit a little weight as some tend to roll a bit at the cut edge. I love my jacket! I hope that if you've never tried a PDF, you'll give it a whirl. I also hope that you'll consider using a fun and colorful contrast to an otherwise neutral color pallet. 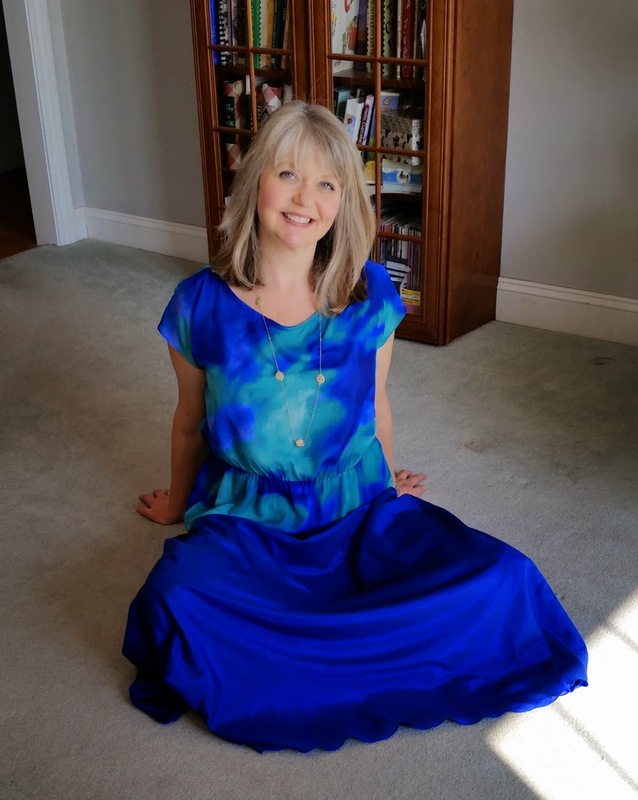 Pretty Peplum Top Sew Along: My Finished Tops + Submit Your Finished Garment!! If you've been following along, you may have seen that the fabrics I use on each tutorial are different. That's because I made four versions of the Pretty Peplum Top! All the fabrics I used are either sold out from our website or from my stash, sorry, we don't have them available for sale! When someone is doing a sew along, they have to practice the pattern until they understand it well enough to help other people. I learned a lot about this pattern and I have to say the fourth one was my best because I worked out all the issues in the first three! 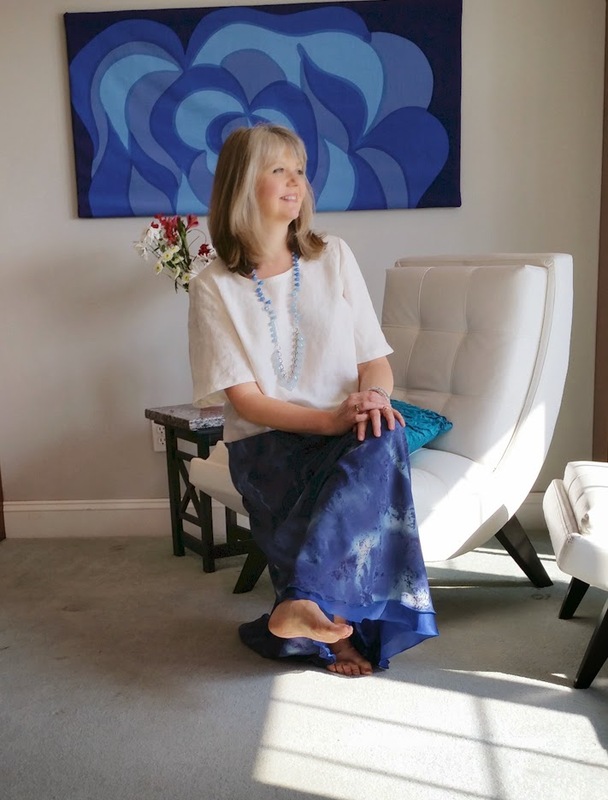 The first top I made was from a ponte knit. When making this top, I cut out a size medium rather than a small. I have no idea why I did this because my high bust was a small. I guess I got scared! I ended up altering the pattern a lot and ended up with size small alterations. I used the un-darted bodice pattern piece for this top. I really wish I would have cut the darted piece because I have some folds around the underarms that could have been eliminated by using the dart front. I also took about an inch off the bottom of the bodice pieces to raise the waistline to a more flattering position. I cut out the scoop neckline and made 3/4 length sleeves. 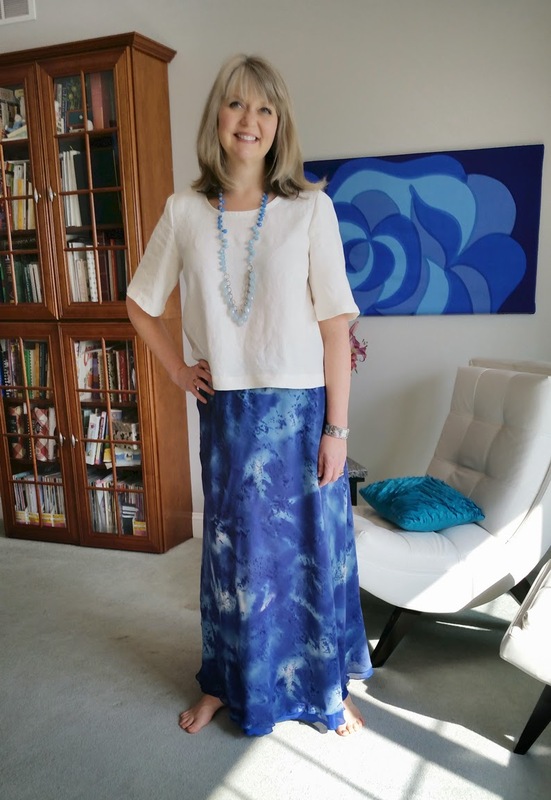 Ann, our of our contributing bloggers, had the same problem with her peplum top. See here. Here's a lovely photo of me attempting to show you the folds at the underarm/bustline. On the second try, I made tested out turning a peplum into a dress. I cut out the pattern in size small but used the un-darted bodice pattern piece again. I didn't use the darted front because I thought that by shortening the armhole that it would help the underarm folds. Once again, I had some folds, but I also had a lot of pulling around the bust and neckline. I used a scoop neckline again and 3/4" sleeves. On the third top, I made a size small still without the darted front again. I was hoping that by making it from a lighter weight fabric that they would show less. They did show less, but there is still a little bit of folding. I also shortened the armhole and waistline. I put a keyhole on the back of the top and used the jewel neckline for the front. I also made 3/4" sleeves. And the last one I made was a size small WITH A DARTED FRONT, cap sleeves and elongated the waistline. I finally decided to use the dart and it was GREAT! I'm telling you, if you were having the same problems I was and had the 3" difference in the high bust/regular bust measurements. CUT THE DARTED FRONT! I'm not sure what the difference was with the waistlines, but I took it back to the original pattern length and it looked better. 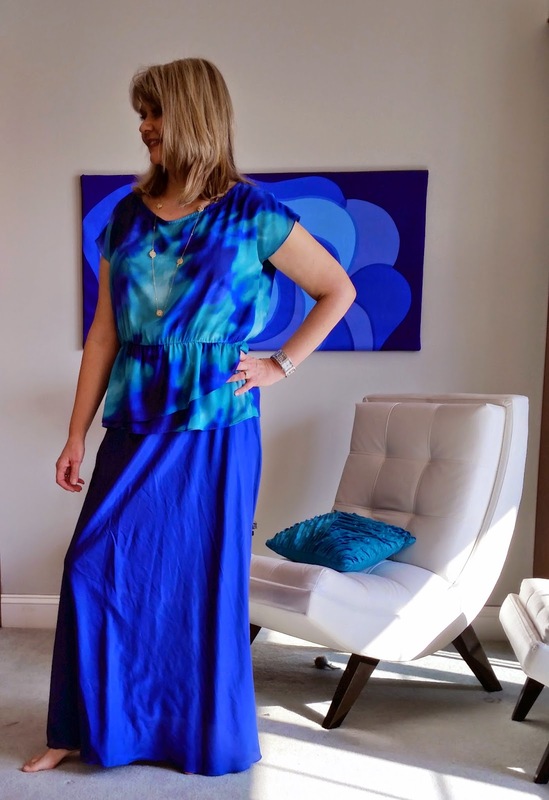 I'm thinking that the fabric weight has something to do with it, but I also think that the darted front allowed the waist to sit on my body better. I used the jewel neckline and just so happen to have a coordinating solid that matched one of the colors in this knit fabric. I wore it with a belt to accentuate my waist too. 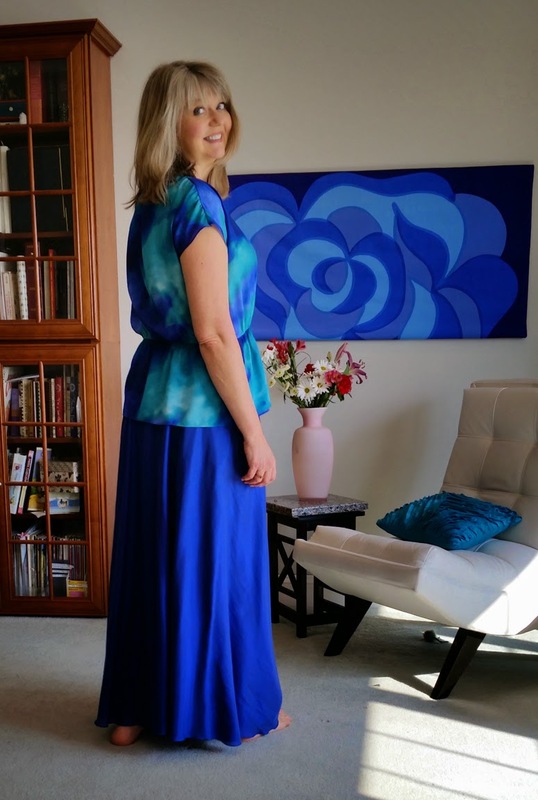 Now it is time to share your finished peplum tops with me! Remember, when we started, I mentioned there would be a random drawing at the end of the sew along! Now's your chance to enter!! Send me your name and at least one photo of your finished peplum top. Also tell me what alterations you made to the original pattern. I think by sharing this information with everyone will allow is to understand the pattern even better! All entries need to be emailed to me (fabricmartblog@gmail.com) by Thursday, March 5! Any late entries will not be accepted. One winner will be randomly be selected on March 6. 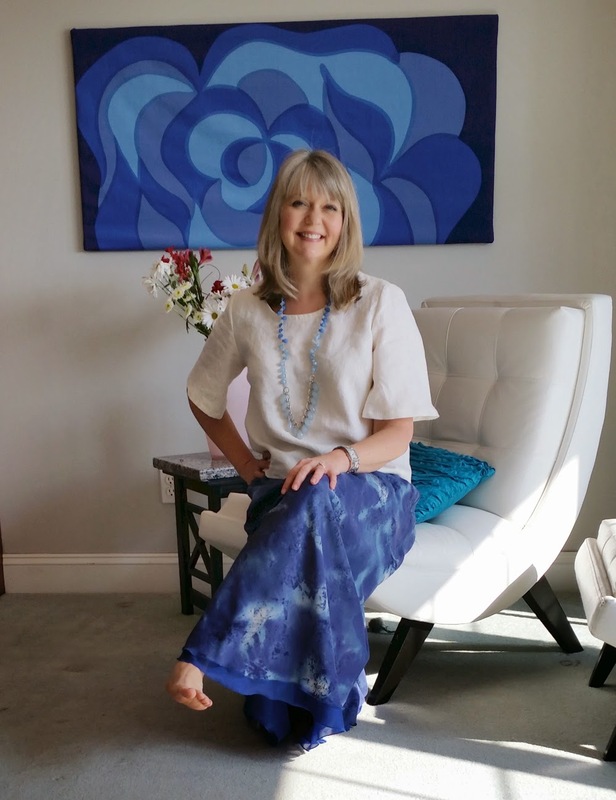 Winner will receive a $100 gift certificate to Fabric Mart AND a $30 gift certificate for Pamela's Patterns! I can't wait to see everyone's peplum tops! We're in the home stretch! All we have to do is stitch the bottom hem and sleeve hem, then we're finished! I wouldn't normally talk about what to do for this, but Pamela has an ingenious way to get a really nice hem. I have been using it on other projects too and it's been great! Pamela uses stay tape to finish all her hems. She likes to use SewkeysE brand, which we talked about HERE. You can also refer to the video on stay tapes in that blog post. SewkeysE has a 1" Double sided Fusible Stay Tape. If you are using this brand of stay tape for this project, you will need to cut the stay tape down to 1/2". I did not have this brand of stay tape at the time, so I found Pellon EZ- Steam II - a Two sided pressure sensitive Fusible Tape at a local fabric store. You will see that I used it in the photos below, but I'd like to try SewkeysE in the future. It was hard to get the tape off of the fusible part once it is fused down. But once you got it apart, it peeled right off. Press the stay tape to the wrong side of the hem edge. 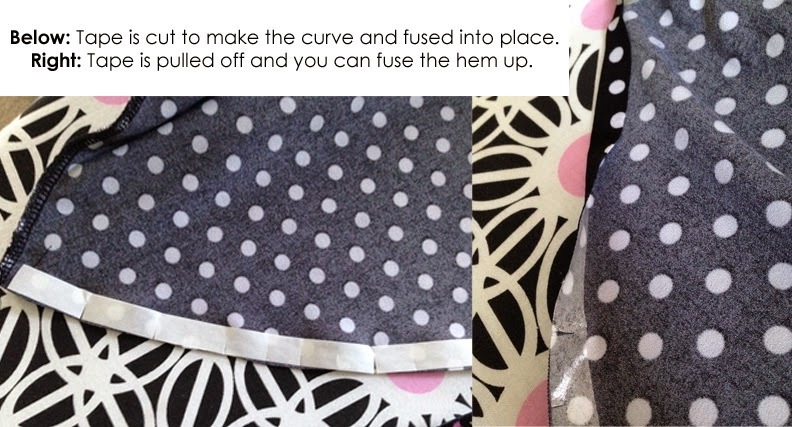 Since the peplum is curved, you will need to cut the stay tape like Pamela mentions in the video. Remove the paper backing, fold up using the edge of the stay tape as your guide and press. Stitch in place! How easy is that? Do the same for the sleeves. If you make the longer sleeves (or any other length than the cap sleeves) use the 1" stay tape. For the cap sleeve cut the 1" down to 1/2". I know a few of you were wondering how you could make the peplum top into a dress. I was curious too and decided to give it a try. It's actually really easy! All you need is some extra fabric (I would say about 2 yards extra), pattern paper, a yard stick or long ruler and a marking tool. 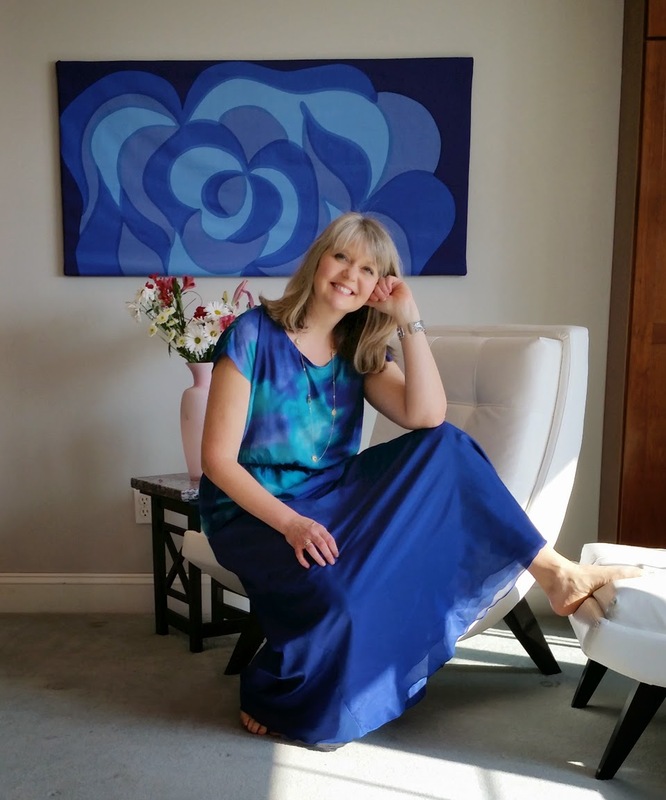 The amount of yardage you need will depend on how long you want the dress to be. Fold the fabric in half, I like to do right sides together. Then line up the peplum front piece with the top of the fold. You want to make sure you have plenty of space for the dress length. 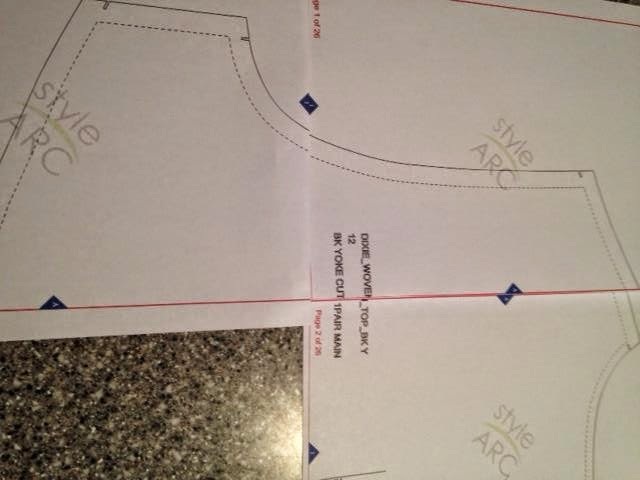 Take a yard stick or long plastic ruler and line it up against one of the peplum side seams. Mark this length. For this demo, I have the dress 18" longer than the peplum piece. 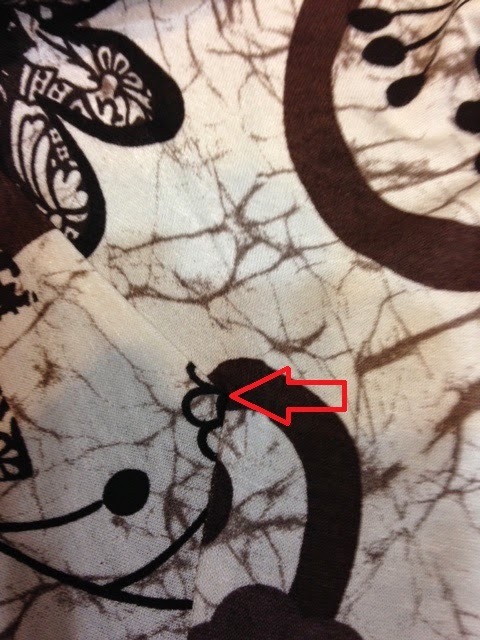 (If you see the photo above, the 18" mark is right at the bottom edge of the peplum. Move the ruler a few inches, keeping the ruler and bottom edge of pattern piece together at the 18" mark. Make another mark. Do this the whole way across the peplum till you have a complete skirt. If you feel like the skirt is too big, you can make it smaller! You can adjust it when you try it on, or before cutting out. If you do it before cutting out, line up your ruler at the peplum waist. Then move the ruler till you feel like you're at a good width. The key is to make sure you keep the sizing at the waist so you don't have fit issues later! Repeat the same step for the back peplum piece. 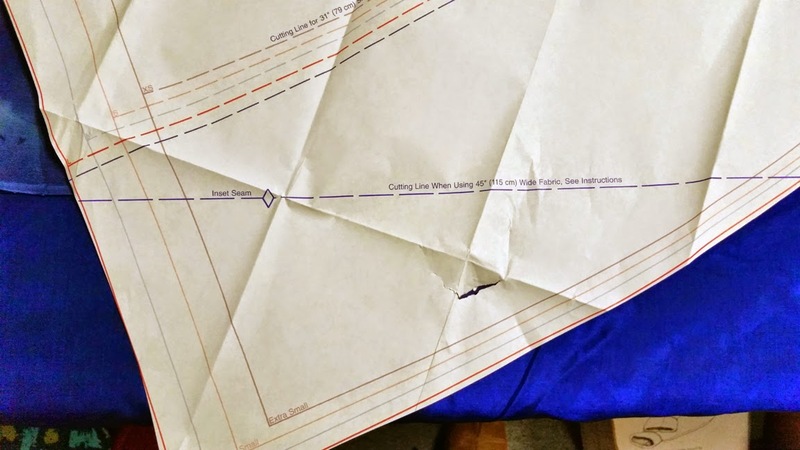 Follow the same steps for the rest of the garment. How easy was that? Here is my finished Pretty Peplum Dress. 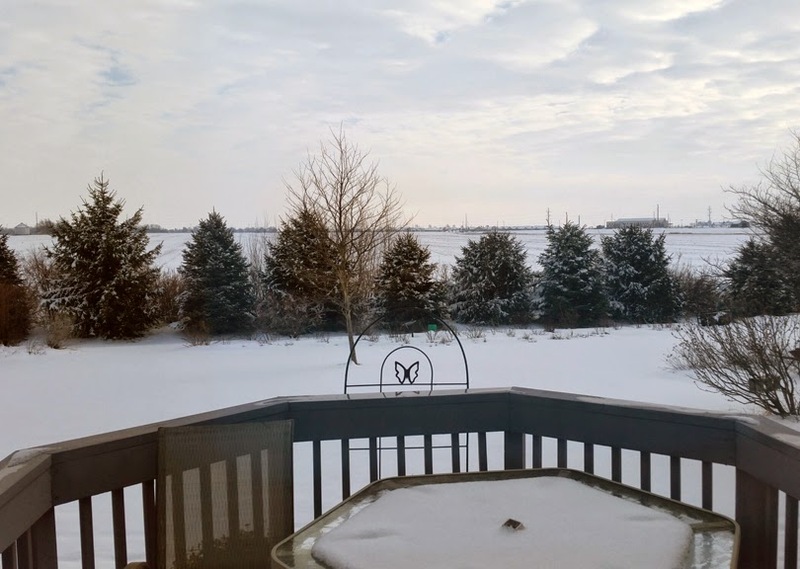 It's been so cold outside to get good pictures, so this will have to do for now! I like the overall look, but in certain photos the waistline does not look flattering to me. I think this may have something to do with the fact that I did not cut out the darted front top piece. Read about that HERE. I plan on taking the front piece out and re-cutting the front with the darted piece. ALSO! 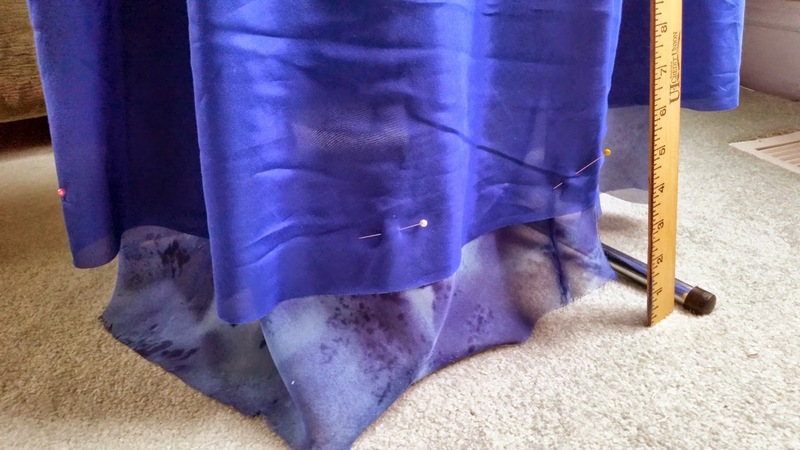 One of our followers, Angela, submitted photos of her muslin --so far so good! Can't wait to see it finished! I'm glad to be back to Fabric Mart's blog with my new cozy flannel. Sewaholic's latest PDF pattern, the Granville Shirt, is the perfect fitted shirt pattern to make a classic flannel shirt while still looking like a girl. 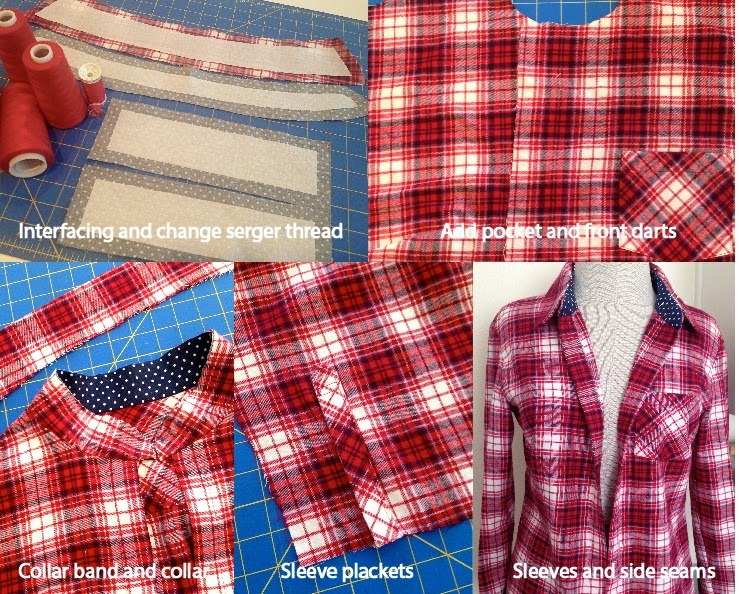 I used this soft plaid 100% cotton flannel from Fabric Mart. It's lightweight and dreamy to wear but it also holds it's shape like a good quality flannel should. So...it didn't actually take me 15 minutes to make this shirt so why call it the "15 Minute Flannel", you ask? Time being what it is in my life right now, I didn't have the opportunity to set aside large blocks of sewing time so I decided to make this shirt in short, 15-20 minute sewing spurts. A shirt like this, with lots of details, is the perfect project to break up into smaller parts. I found sewing this way made me take my time and focus on each part to be sure everything was done right. 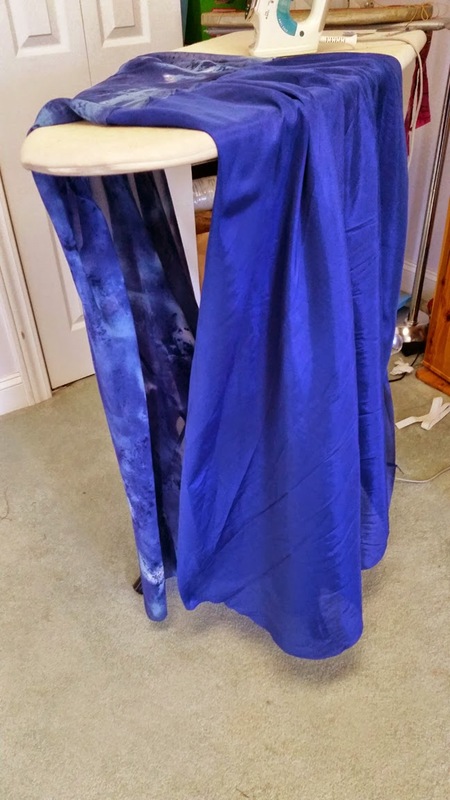 In just 15 minutes or so I could do quite a few separate things: apply interfacing and change serger thread, add pockets and front darts, attach collar band and make collar, make sleeve plackets and sew side seams and set in sleeves. 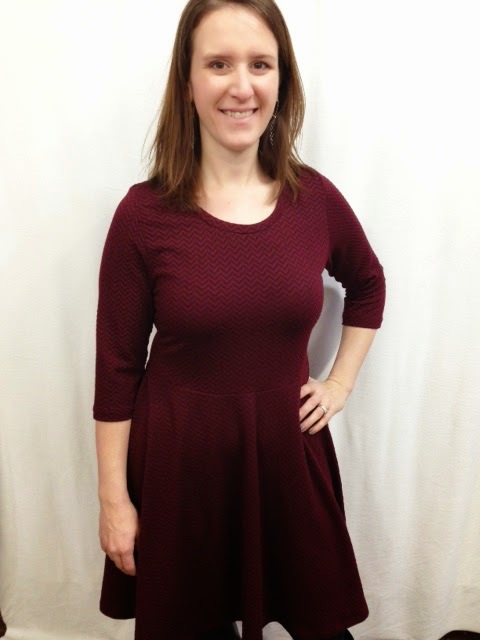 Sewaholic's patterns are geared toward the pear shaped figure which is quite refreshing for the sewing community. I wouldn't consider myself a pear shape, so I took out some of the hip curve in the side seam. You can see here it's pretty curvy! The instructions have lots of drawings and well written step by step instructions which lend itself to sewing in small time increments. The pattern uses mostly traditional construction techniques aside from the collar. I was tempted to use my usual collar application but I decided to stick with the instructions (I know...yay for me for following directions). The collar band and collar band facing are attached to the neckline of the shirt first (like the photo above), then the collar is attached to the band. This is the first time I've ever seen this in a collar and I had to read it a few times to get it. The collar band and facing are then stitched, right sides together from the tip just to where the collar starts. After turning the collar band right sides out, the collar is sewn to the band and slipped in. 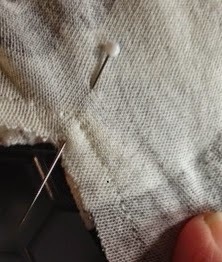 It worked great and it made topstitching a breeze. I made three small changes to the shirt. First, I cut the pocket, sleeve cuff and back yoke on the bias, second, I made the collar band facing and cuff facing out of contrasting fabric (polka dots because what could be better?) and lastly, I used pearl snaps instead of buttons and that made it easy and fast. This Granville pattern is a perfect wardrobe staple It makes up great in casual flannel but it would be beautiful in a floral voile or classic in crisp white broadcloth. I'm sure I'll be making it again soon. This is likely my last winter project and now I'm off to thinking about spring sewing. What's next for all of you?